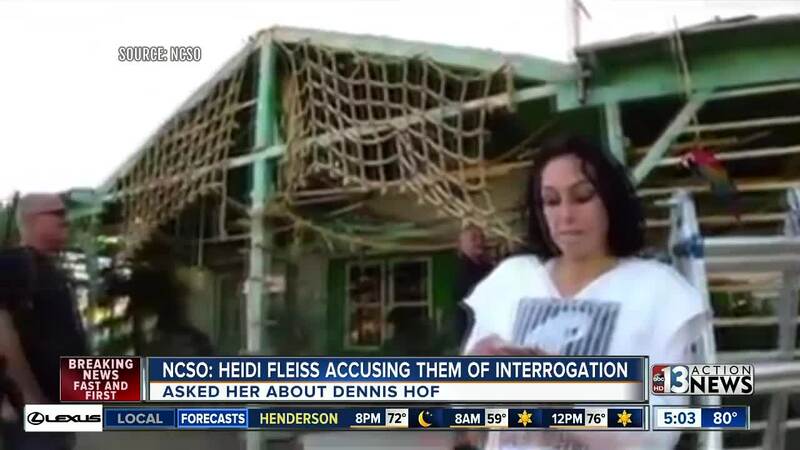 The Nye County Sheriff's Office has released a video of deputies questioning former madame and television personality Heidi Fleiss in connection to Dennis Hof's death on Oct. 16. The video release, which was posted on NCSO's Facebook page, starts off by saying that Fleiss has accused the Sheriff's Office of interrogating her and accusing her of Hof's death. It then says that the Sheriff's Office takes all accusations seriously and will not tolerate "blatant lies against its staff." The video clip with Fleiss starts out with a deputy asking Fleiss about Hof possibly being given an edible by Fleiss and saying that she is not in trouble, but they are trying to figure out if it could have contributed to his death. Fleiss explains to the deputies that Hof reportedly took edibles regularly because of diabetes etc. The deputy then says something about wanting to make sure that Hof was not "poisoned." Fleiss then begins talking about Xanax bars and about how she has tried making marijuana her thing, but it's just not for her because it knocks her out. Fleiss goes on to say that she saw Hof's health deteriorate and she doesn't believe an edible had anything to do with it. The Pahrump resident reportedly spent time with Hof the day before his death but did not attend his campaign event or birthday party. It's not clear exactly what Fleiss has said about the Sheriff's Office. 13 Action News was unable to find anything that has been posted online. We are attempting to reach Fleiss. Fleiss spoke to 13 Action News after the 72-year-old candidate for the GOP Assembly was found dead by Ron Jeremy at Love Ranch. Love Ranch also made headlines just over three years ago after then-NBA star Lamar Odom was found unconscious after an overdose at the brothel. The Love Ranch is currently closed. An official cause of death has not been released for Hof.